Victoria Stodden is an associate professor in the Graduate School of Library and Information Science at the University of Illinois at Urbana-Champaign. She completed both her PhD in statistics and her law degree at Stanford University. 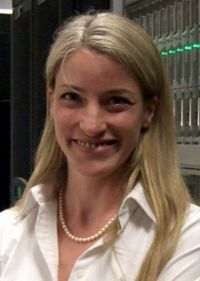 Her research centers on the multifaceted problem of enabling reproducibility in computational science, including studying adequacy and robustness in replicated results, designing and implementing validation systems, developing standards of openness for data and code sharing, and resolving legal and policy barriers to disseminating reproducible research. This session will shine a “spotlight” on numerous resources available to University of Pittsburgh researchers including the library’s customized experimental protocol search, InfoBoosters, and LabArchives. This project has been supported in part or in full with federal funds through the National Library of Medicine (NLM), National Institutes of Health (NIH) under cooperative agreement number UG4LM012342 with the University of Pittsburgh, Health Sciences Library System.